Ever wish that your headphone wires would not get tangled up? Here a way to free your headphones from your detector and still remain connected to it. 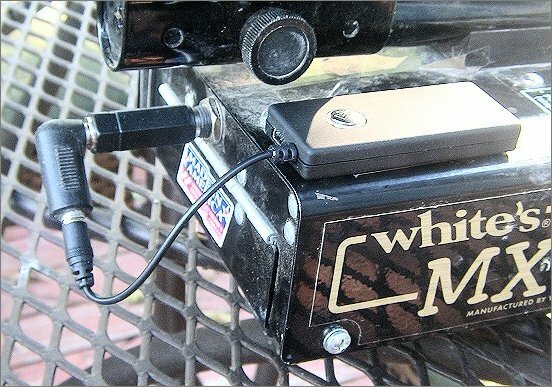 Wireless headphone connections to your detector are possible with a few purchases from the Internet. The total for the conversion cost less that $40. All that is required is a set of Bluetooth headphones and a small Bluetooth transmitter like the ones shown in the picture below and a few headphone jack adapters. 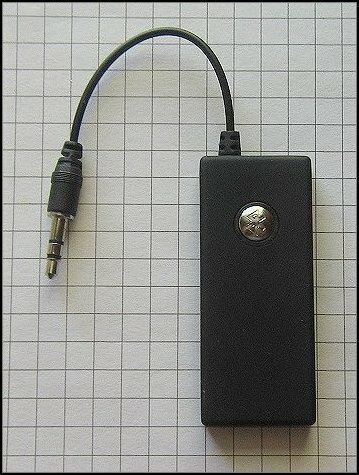 The transmitter is attached to your detector with a piece of Velcro strip and is plugged into the detector's headphone jack with a small adapter plug (shown below). Pair of Bluetooth Headphones with Small Bluetooth Transmitter that can be Purchased on the Internet. Some caveats on your purchase: Be sure both the headphones and transmitter use the same version of Bluetooth. In general, higher versions of Bluetooth are downwardly compatible with lower versions. .The one shown in the picture utilize Version 2.0 and 2.1. If there are differing versions of Bluetooth between the two units they might not work together. Also be sure to follow the initial charging instructions for both units. The headphones must be charged by way of a computer's USB port using the included USB cable. Do not use an external wall charger. USB Charging cables and charger are also included with the Bluetooth transmitter. Audio cables (non-Bluetooth use) are included with the headset. The headset can be charged by plugging it into the USB port on any computer. The small transmitter/headphones are practically universal and can be used on laptops and PCs, tablets, X Boxes, cell phones, and TVs, anywhere audio needs to be listened to without disturbing others. It works literally with any device with a 3.5 MM stereo plug. It has a transmit range of approximately 30 feet. 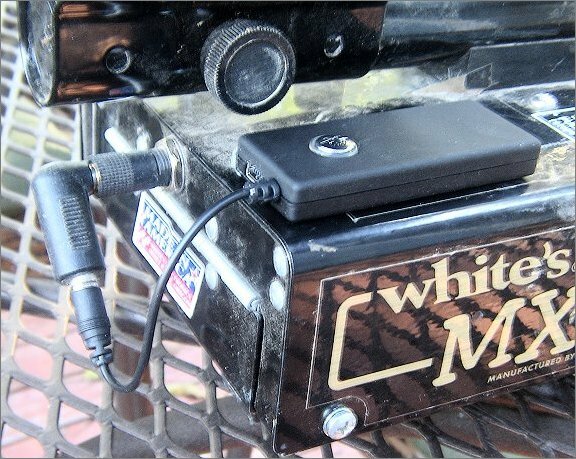 The transmitter will operate for about 4 hours in the field while the headphones can be used up to 10 hours. Turning off the transmitter requires a 3 second press of the button on its front. INTERESTING: In the field, you can distance yourself from the detector by the range of the transmitter (> 30 feet) and the detector's signal will cease in the earphone. 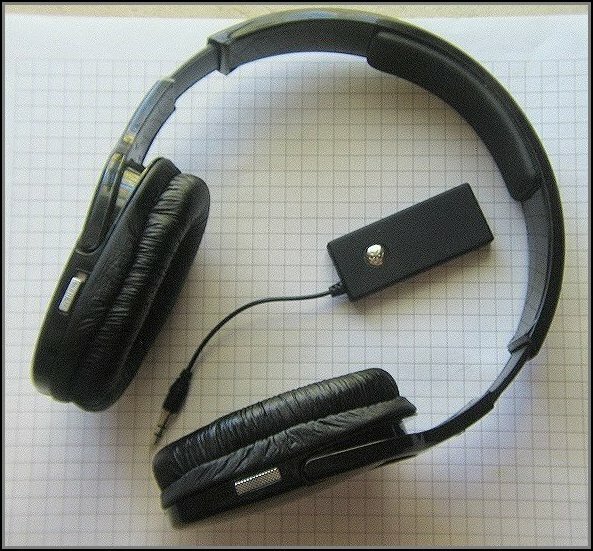 But as the headphones come into range the detector's signal, the connection is automatically established in the earphones. This eliminates the reestablishment of signal between the two devices. There are three types of headphone adapters that can be used to connect to your detector as shown below. All are stereo adapters. 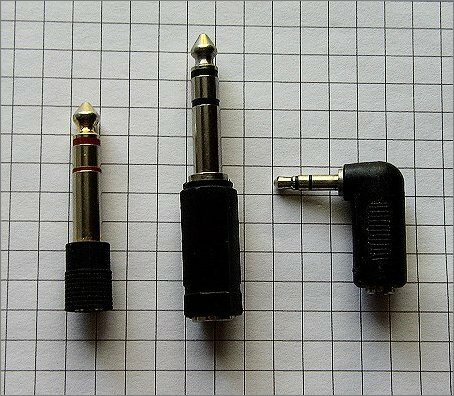 The thicker 6.5 mm adapters fit into your detector's headphone jack. These are of varying lengths. Recommended is the use of the shorter 6.5 mm adapter since this will not extend as much from your detector's "box". A small 3.5 mm right-angle adapter is also of use. All of these combinations are shown in the figures below and can be successfully used..
Three types of headphone adapters that can be used to attach the Bluetooth transmitter to your detector. To the left, are the familiar 6.5 mm to 3.5 mm adapters used to directly plug into the detector headphone jack. They come in two lengths. On the right, is the 3.5 mm right angle adapter that is recommended to be used with either of the larger adapters. Bluetooth communications between devices is called "pairing". Pairing is accomplished between Bluetooth devices through an electronic "handshake" between the units. Pairing Instructions are included in the manuals of the headphones and the transmitter. Follow these for a flawless "pairing". The author found that it appears that the headphones should be turned on first in the pairing followed by the transmitter. Flashing lights on the transmitter will change color when the pairing is complete. 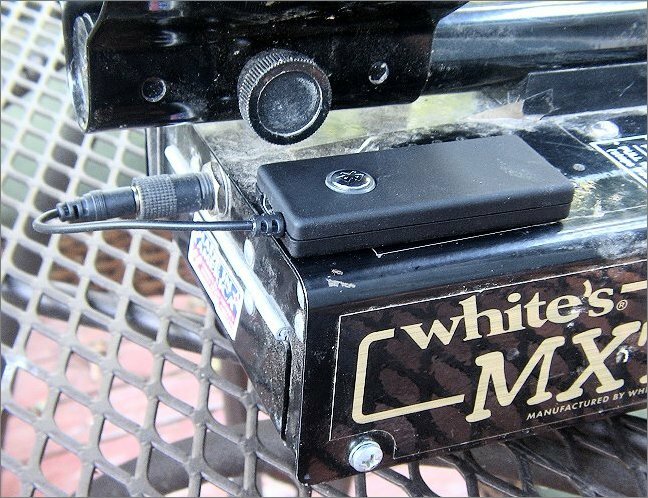 After pairing, the transmitter is next plugged into the headphone adapters and it is attached to the detector's "box" (shown below). The attachment of the transmitter to the detector box is made with small Velcro "Sticky Back" strips. Mount the "fuzzy side" of the Velcro to the detector's box and the hook side of the Velcro to the bottom of the transmitter. In this way the transmitter can be easily removed for charging. Charging time on the transmitter is usually less than 2 hours while that of the headphones is 4 hours. Using Short Adapter (recommended). Just to the left of the transmitter wire going to the detector is a micro USB port used for charging the unit. You may find that this addition to your detector will be of help. * Epilogue: The author field-tested two Bluetooth transmitters with his detector and found that neither was able to locate a target correctly. The problem is that the transmitter has too much "latency" or delay in transmitting to the headphones. This places the target in the wrong location on the ground and in some cases, creates multiple false locations. This adaptation using Bluetooth transmitters and headphones is considered to be a failure until better transmitters are found.